A NEW SURVEY of Irish female drivers has found that nearly a third of women are wearing their car seatbelt incorrectly. The study (which can be viewed here), taken by Behaviour and Attitudes on behalf of the Road Safety Authority (RSA), polled 300 Irish women aged between 17 and 34 on their driving habits. 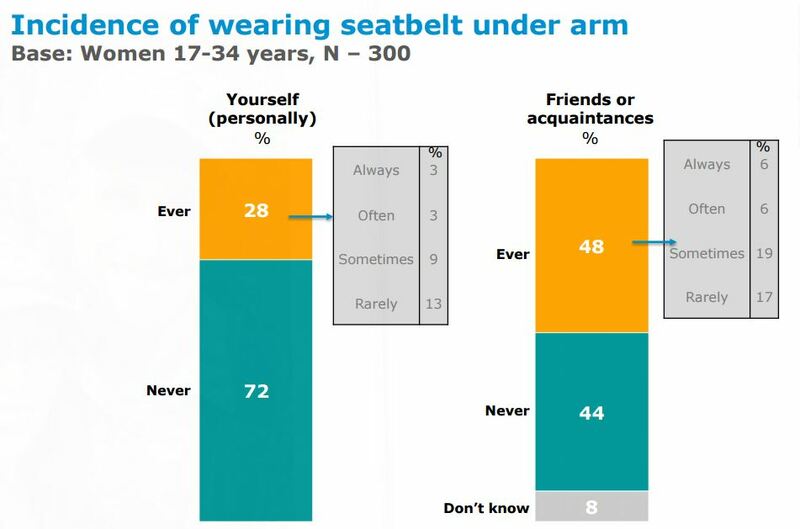 The survey forms part of a new RSA online campaign targeting women who wear their seatbelts incorrectly. Doing so can lead to “horrific” injuries according to the RSA. “Whether for comfort or vanity, many women choose to wear their seatbelts under the arm, instead of over the shoulder, which exposes them to terrible injuries and even death in the event of a crash,” said Moyagh Murdock, chief executive of the RSA. Placing the shoulder strap of the seatbelt under their arm leaves your upper torso — including your neck, face and head – completely unrestrained during a collision. My message to anyone who wears their seatbelt under their arm is simple – wear your seatbelt correctly. Email “Almost one in 10 Irish women wear their seatbelt underarm to avoid ruining fake tan”. Feedback on “Almost one in 10 Irish women wear their seatbelt underarm to avoid ruining fake tan”.